After four studio records, one live album. Released in 1981, "Exit... Stage Left" concludes in a beautiful way RUSH's second period, often considered as their most progressive and creative. The set-list consists in extracts from "Fly By Night", "2112", "A Farewell to Kings", "Hemispheres", "Permanent Waves" and "Moving Pictures", recorded at concerts in UK and Canada. The set-list is more varied and colorful than on the band's first live release, "All The World's A Stage". Still played with the same energy and virtuosity, the tracks have been quite reworked in the studio. Furthermore, Geddy Lee's singing sounds less juvenile and enraged, but rather mastered and fluid. 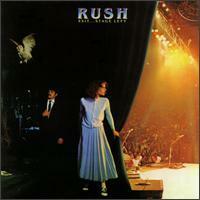 The cover art (front plus back) contains elements from all RUSH's studio albums from 1974-1981. "YYZ" includes a mindblowing drum solo by professor Neil Peart, displaying his knowledge and technicality, whereas Alex Lifeson has sharpened his axes on "Jacob's Ladder". Not featured on any other live or studio release by the band, "Broon's Bane" is the novelty here. A nice short instrumental acoustic guitar piece by Lifeson, introducing "The Trees". With "Xanadu", the these two songs see their orchestration enhanced by the addition of cool synthesizers accompaniments. Same goes for "La Villa Strangiato", incorporating also great alternative guitar interventions. Unfortunately, these are also the first official released performances with the super soapy ballad "Closer To The Heart", which appearance will become recurrent at the trio's concerts.